The ScentFlash™ is an 8” high UV in-line spinning flasher featuring a patented scent release system. Sling Blades, Cripplures, Humdingers, Wiggle Hoochies, Shuttle Hawks, and much more. 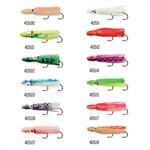 Mack's Lure Smile Blade Lures including Wally Pops for trout, kokanee, walleye, perch, shad etc. Mack's Lure Wedding Ring Spinners. A classic since 1969. Mack's Lure Sonic BaitFish for jigging, casting or trolling. 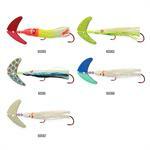 Mack's Lure Smile Blades add flash, action and vibration to hoochies and many other types of lures. 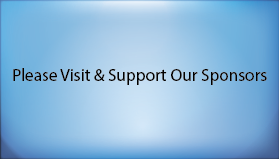 Great for trout, Kokanee, walleye, salmon, crappie etc. Mack's Lure Shuttle Hawk and Ultra Releases make stacking rods while trolling simple. 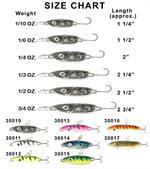 Mack's Lure Components for building lures. Mack's Lure 1/2 Ounce Hum Dingers. Troll these fast for big trout. An excellent bait fish imitation with the added "hum" of the sound chamber. 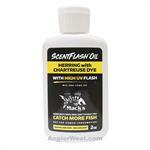 ScentFlash™ Triangle Flashers attract fish by sight and smell. 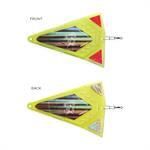 A revolutionary in-line triangle flasher. Designed specifically for the ScentFlash™ UV Triangle Flasher, these premium scent pads are manufactured to hold and release scent underwater for an extended amount of time. Pack of 4. The smaller size of this hoochie, featuring glow and UV colors, makes it idea for kokanee, trout and landlocked salmon. Sonic BaitFish - 1 oz. Mack's Lure Sonic BaitFish. A simple but extremely versatile and effective lure for trolling, jigging or casting. 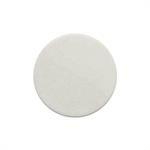 1/100z thru 3/4oz for extreme versatility. The "Nightmare" Wedding Ring by Mack's Lure. An Angler West exclusive color pattern. Includes a green soft glow bead for added attraction. Each is rigged with 10 lb. leader material and includes a green, soft bead on the black, wide gap hook.